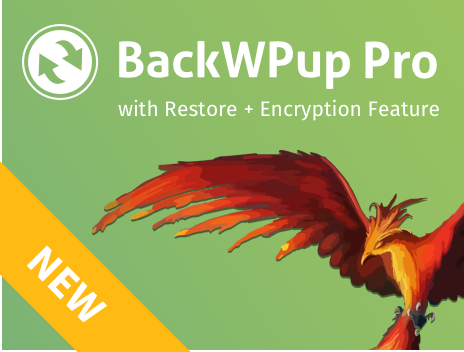 BackWPup 3.6.1, BackWPup 3.6.2 and BackWPup 3.6.3 are versions with collected bugfixes. In this blog post we give you further information about what works now and why it didn’t work before. When creating the backup archive, some file names were sanitized and in some circumstances this changed the file names and removed diacritics and accents leading to incorrect file names. Also, sanitizing the file names that contain multiple extensions like “.min.js” were renamed to “.min_.js” for security reasons by WordPress. We decided that since we cannot know which kind of files the user may have we don’t want to add additional security stuff when we create the backup. So, now the files are stored in the archive as they are. If you have restored backup files in your root installation after a recently performed restore and you make a backup the database backup file that goes into the backup is the one you have currently in the root directory and not the generated one when you create the backup. Was not possible to restore a complete database backup because the table `woocommerce_downloadable_product_permissions` depends by another one. We set the database to not consider foreign key when we perform the restore, this fixes the problem and allows you to import the entire database correctly. Ftp destination downloader repetitively open a new handler for the source file causing corrupted backup.